Children ask, Who is God? And we explain to them that God is the Creator and the source of all life. But who is He? God is a Trinity of Persons. He has revealed Himself to men through the prophets and especially in Christ. God was never alone before the creation of the universe. God is from all time the communion of Three Divine Persons, not three Gods, but one God who is Father, Son and Holy Spirit. 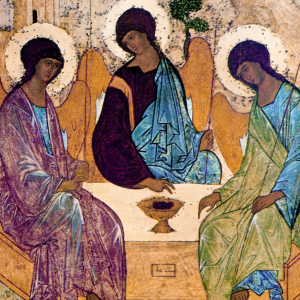 Jesus Christ, who is the Eternal Son of God, reveals the Trinity to us. In truth, the Gospels “composed by the inspiration of the Holy Spirit” are written account of God’s revelation of Himself to us. But wouldn’t it be simpler to speak of God alone, and not worry about the different persons? It might well be the same to say to someone living in your home, “all that matters is that you are a human being; it does not matter who you are and who your father and mother are.” Far from saying this, we wish to know more about the persons who live with us, especially if they are good and dear to us. Because God is Father, Son and Holy Spirit, Christians have always wanted to know and enter into the mystery of the Blessed Trinity. Our understanding of this mystery was developed in the fourth century as a result of a number of errors. Fifteen hundred years later John Henry Newman studied and explained these heresies in his first book, The Arians of the Fourth Century. Arius was a priest from Egypt who taught that Jesus was a created being, the most perfect creation of God. St. Athanasius in the fourth century championed the truth with the correct interpretation of the Scriptures which speak of the humanity and divinity of Christ. Jesus teaches us: “I am the way, the truth and the life.” He is the way to God, to the Blessed Trinity. Christians must constantly turn their gaze to Christ through whom we gain access to the Father in the Spirit. Newman in England and Johannes Moheler in Germany inspired a renewal of theology based on studies of the early Christian sources in the Scriptures and the Church Fathers. This renewal was furthered by other theologians, especially French and German theologians in the 19th and 20th centuries, and subsequently by the documents issued by the Church at Vatican II. This spiritual and doctrinal renewal leads us to consider the centrality of Christ in the liturgy and the life of the Church, and to meditate on the Scriptures in order that we gain knowledge of Christ, and through Christ we gain knowledge of the Father in the Holy Spirit. Christ, far from merely an historical figure, instead is a Living Person whom we need to get to know personally, not just someone about whom we learn some facts. In the sermon quoted above, Newman continues: “And as He is still with us, for all that He is in heaven, so, again, is the hour of His cross and passion ever mystically present, though it be past these eighteen hundred years. Time and space have no portion in the spiritual Kingdom which He has founded; and the rites of His Church are as mysterious spells by which He annuls them both.” He does not mean that time and space are not important, only that they do not separate us from Christ who lives in His Church and acts towards us through the sacraments. The reading of spiritual writers and the study of the Church’s doctrines will introduce us slowly into the inner life of God. The daily prayer of the Glory be to the Father brings us before the mystery of God, and is a simple way to give praise God in His Trinity and Unity of persons. In the ninth century, Bede, the English saint and doctor of the Church, shortly before his death, told his brother monks: “the moment of my departure is eminent; I desire to leave to be with Christ; my soul wishes to see in all his splendor Christ.” He was dictating the last chapter of a work of theology on his deathbed and when he was through he asked to be propped up to be able to see the chapel where he used to pray. He then began to recite the Glory Be, and when he mentioned the Holy Spirit he exhaled his last breath. If we desire to live and die with that closeness to Christ and knowledge of the Trinity that St. Bede had, let us desire to know God as He has revealed Himself, and to pray devoutly the prayers that praise Him as the One and Triune God. Office of Readings, St. Bede the Venerable, May 25.